← Flinders Ranges, South Australia. The Flinders Ranges was an amazing place but we only just scratched the surface as there is so much more to see and do, we can’t wait to return another day, but for now we’re off to Adelaide with a detour via Peterborough, not far from the Flinders. 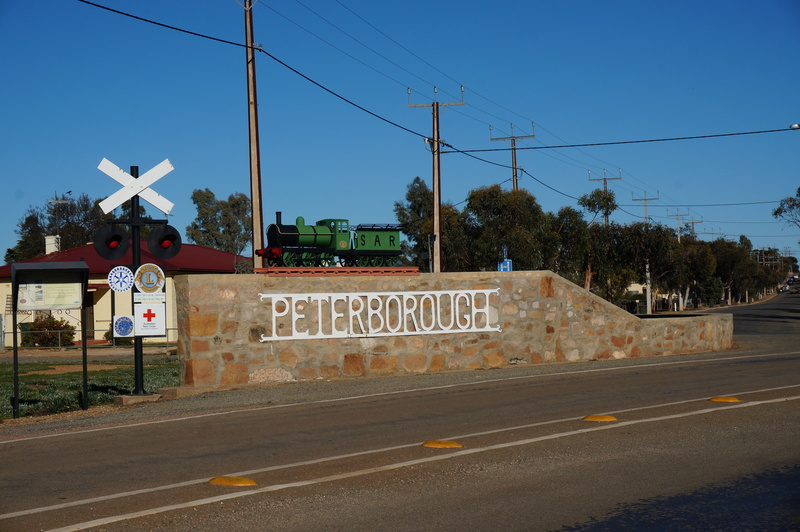 This little gem of town is a railway town which was built as one of three steam train maintenance depots within South Australia. The weather was warmer on our arrival but not hot by any means. The Caravan Park wasn’t far from the centre of town and was our home for two nights, it was a tidy little park with plenty of character, backing onto open paddocks with a beautiful park next door. Our site at Peterborough CP. Murray wanted me to play cowgirl on this old dray. I thought my new hat was good enough. Steamtown has converted the heavy maintenance depot into a museum and we took ourselves along for the early morning tour with Bec our guide. It took in all the old trains which are housed in the roundhouse plus a few other displays. We were there for a few hours and by the time we finished I was like an iceblock as inside the old building was bitterly cold. The tour was fantastic. From there we headed to Magnetic Hill about 27km from Peterborough. We did just what the sign said to do and to our amazement we were going uphill backwards not in gear and without any hands. Intriguing. After we took a walk around the streets of Peterborough with its beautiful old buildings. Peterborough Town Hall. Beautiful old building inside and out. I have put out this video in as proof of what happens on this hill. Be patient and it will play. Enjoy, we had a good laugh especially with Murray swinging himself around in the door. That evening we returned to Steamtown to take in the light and sound show. We sat inside an old carriage,where it was nice and warm, and watched a movie, on a drop down big screen outside the roundhouse, about how this industry was formed in this town and its surrounding areas. It’s sad that this place is no longer used for the purpose it was built but it really was worth going to visit and hear the story. The next day we set off for Adelaide stopping at Burra for a cuppa and Morgan for lunch. After this we caught a ferry across the Murray River in Waikerie, drove down through the hills arriving in the late afternoon at Max and Tricia’s in Klemzig where we would stay for the next week. Murray used to live in this house with Max when he was in the Airforce, so he had good memories here. Our first evening was a big one with all the catching up being done, a lovely roast dinner cooked on the Weber and a few too many drinks, for some whom I won’t mention, Murray and Tricia, being enjoyed late into the night. Poor Tricia wasn’t at all well with a sinus infection when we arrived but she soldiered on and once the antibiotics began to kick in we were able to continue enjoying our time there. Our first day was a quiet one with some housekeeping of the vehicle and trailer, a walk around the local area and a shepherds pie for dinner. The first outing was to the Adelaide Hills where we visited Melba’s Chocolate Factory, Bird in the Hand winery, the National Motor Museum in Birdwood, tried cheeses at Udder Delights, bought some handmade fudge and had lunch in Hahndorf and lastly the Beerenberg Farm and factory before returning home for a cheese platter dinner and a well earnt sleep that night. What a huge day. 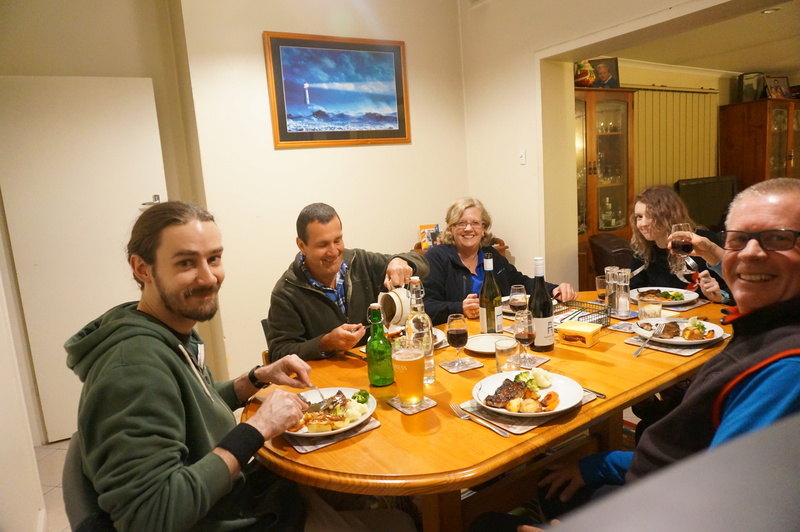 After such a busy day in the Hills, the next day we decided to have a break to get washing up to date and relax before heading out with Max’s brother and wife, John and Lyn to happy hour at the Casino in Adelaide then dinner at a Thai restaurant. What a wonderful night we had. Happy hour at the Casino. Tricia still wasn’t well but was able to taste a little better so we ventured out to the Barossa Valley for a day. 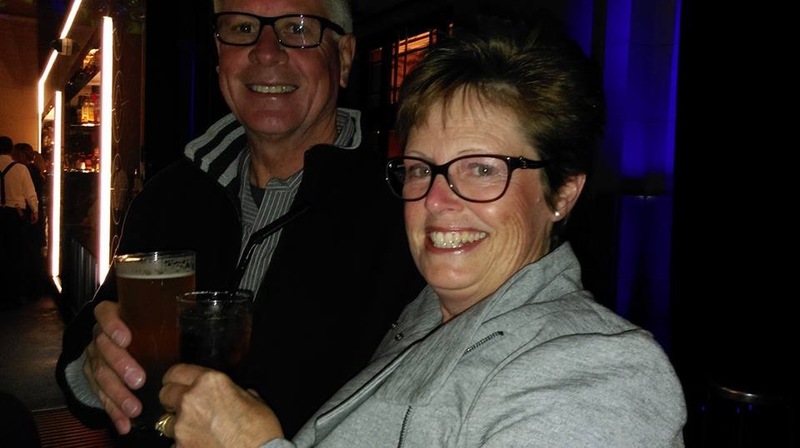 First port of call was the Chateau Tanunda winery set in all its grandeur on a picturesque property with its majestic old buildings and picture perfect gardens. We were happy with our tastings and purchases here. Off to the next one. Grant Burge was next but we needed to eat as well before indulging anymore so we had morning tea/lunch in the cafe here, then it was time for some port and Muscat tastings. Mmmmm, heaven. Tricia knew what she wanted from here so she made her purchases up front without tasting. I, on the other hand, made my purchases after tasting. Hey, someone had to do it. The view from Grant Burge wines. Maggie Beer Farm is at Nuriootpa set among the olive trees and farm fields. This place was very busy with plenty of produce to be tasted. I must say I was a little disappointed Maggie wants there but I hadn’t let her know I would be there either. Anyway, tastings done, purchases made, off to the next stop which was Barossa Valley Cheese. Wow, these cheeses were the best. I have now learnt that I eat my soft cheeses too early, they need to be more ripe and runny before consuming. Lesson learnt and I now enjoy them even more. Shame about that. Home to Max and Tricia’s we headed to enjoy some of our purchases and a lovely chicken curry made by Max. Another fabulous day but I think we need an extra trailer to get our things home now. Sorry Murray. Every time we have a big day out we had a rest day because we could. The dog, Patches/Shorty certainly appreciated us all being home with him for a change and it gave us the opportunity to teach Tricia to play canasta during the afternoon. That night max out his culinary skills to work once again and made pasta from scratch. He entertained us all with his prowess in the art of pasta making and Tricia made the sauce to go with it. What can I say but it was amazing. I now need to bring this skill into my kitchen when I get home. Can’t wait. The evening was complete with Canasta, a Grant Burge 10 year old Muscat and lots of laughs. Murray and I did our shopping on Monday ready to get back out there on the road of adventure. Our time with these two lovely people had been wonderful. We spent our last evening with them and their daughter, Amy and her boyfriend Guy, enjoying a barbecue dinner and some more Canasta afterwards. This time we had the music pumping and the singing and actions happening into the early hours. Sad as it was we hit the road once more, refreshed and relaxed from our time in Adelaide with friends. Thankyou, Max and Tricia we shall return again. 4 Responses to More Time with Friends. We enjoyed having you, you’re all welcome any time. Another great story to tell. Loved the look of Steamtown and Magnetic Hill. It reminded me a little of the Melbourne High Country with the wineries. Great you could catch up with long time friends and spend time with them before heading off again.